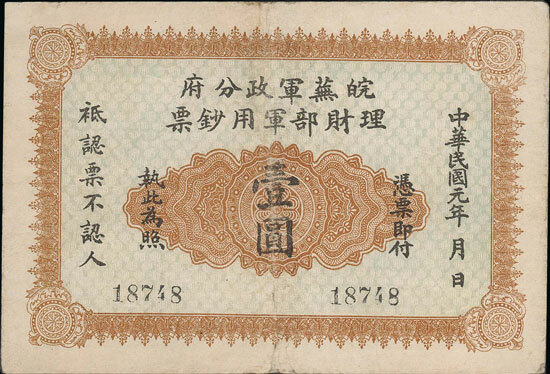 Rare Chinese Wang-Ho Bank of the Republic Banknote to be offered in our 17th October 2018 auction. 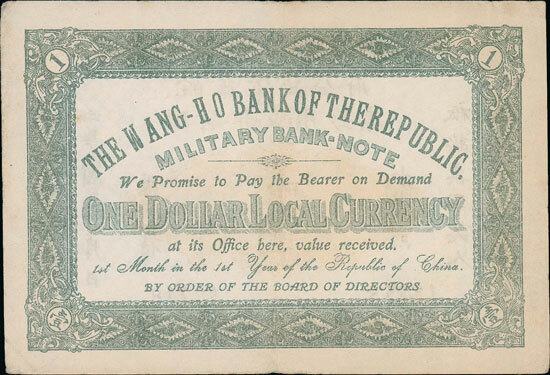 Lot 382 in our 17th October 2018 auction is this rare Chinese The Wang-Ho Bank of the Republic, Military Bank-Note, dated 1912, One Dollar Local Currency, with serial number 18748. It measures 142mm by 97mm. The obverse is printed with green ink, the reverse with brown over a green under print. The obverse is also overprinted with Chinese script in black ink and is graded as good fine. It has an auction estimate of £2,000. The full 17th October 2018 auction catalogue is available to view on our website, which also has details on how you can place bids. Our Twitter and Facebook accounts also include updates of all our latest auction news.